Yess! We have decided to organise this workshop also this year! After 8 years, we still love it! 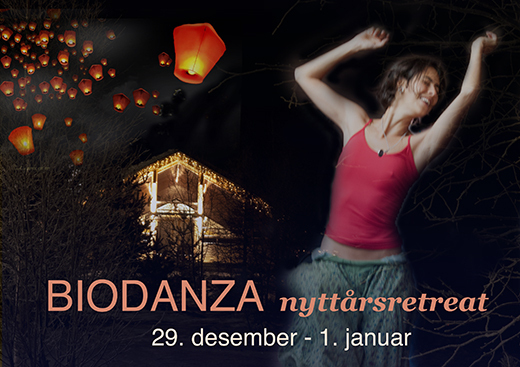 Welcome to the 8th Biodanza New Year workshop at Dharma Mountain in Valdres, Norway. During the 4 days we will welcome both our uniqueness and active expression, as well as expanding our capacity of diving into the healing harmony of unity, of belonging, of melting and surrendering. The perfectly balanced flow of yin and yang, together with a warm and connected heart, is what makes our lives flourish. Through dance and human contact we open up to connect deeper with ourselves, with others and life in all its totality. Every year the vivencias change. Together we create the journey. However, all the five lines in Biodanza (Vitality, Sexuality, Creativity, Affection and Transcendence) will be present. We will awaken all these aspects of our lives, and give them space to be lived at this transition into the New Year. Let go of what you no longer need to carry and open up to the path of your heart! The retreat takes place in the middle of wild nature with mountains, rivers, trees, fresh air and clean snow. We have again chosen the beautiful www.dharmamountain.com in Hedalen in Valdres as our venue for the retreat. Here you will enjoy delicious food, hosted by warm and caring staff. For the 8 last years we have had a fantastic time at the Biodanza New Year retreat. After a one-year break last year, we are now back again. I am once again happy to invite new and old participants to this healing and joyful journey. We highly recommend that you have previous experience with Biodanza. We also recommend that you take a look at www.biodanza.no to get some more information about biodanza. Maximum 40 participants. The workshop has been fully booked several years. To reserve your place please pay a deposit of 600 NOK. When the deposit is paid before 29th November, the total price for the workshop is 4.850 NOK. When the deposit is paid after 29th November, the total price for the workshop is 5.450 NOK. Please transfer the remaining payment for the group to our bank account by 22nd December. (Single room: There might be single rooms available. Additional cost if available is 1.200 NOK. If you are interested in having a single room, you can put your name on a waiting list. Program: There will be five to five to six Biodanza sessions, as well as a new year celebration. The venue (Dharma Mountain) is located about 2 hour's drive south-west of Oslo. You can go by car or by bus. You take the Bus to Nes i Ådal (This is the line called Valdresekspressen). From there you take a taxi 15 minutes. It is easy and not expensive to share taxi with other people for the last part of the journey. Click here to see road descriptions and information about bus transportation. You will sleep in holiday cottage. Each cottage has two bedrooms, with two beds in each room. One cottages have 3 bedrooms. There will be two persons in each room. Every cottage has its own bathroom! The classes are given in English only.I case we will only ba Norwegian speeking partisipants, we will use Norwegian. All vivencias (workshops) will be given by Unni Heim. Unni is the director of The Rolando Toro School for Biodanza - Norway and is the founder of Biodanza in Norway.